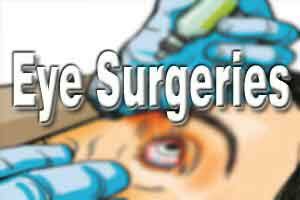 Chennai: Twelve years since the incident, a private hospital has been finally charged guilty for alleged medical negligence on a case of a botched up eye surgery here. In this particular case a woman had reportedly lost vision in her right eye, a case of alleged medical negligence directed towards the private hospital. As a result of which a consumer forum has now slapped a fine of around Rs 1.29 lakh on the private hospital. The emerging details on the case imply that S Kamatchi of Avadi (the victim in this case) contacted Dr S K Krishnaraj of Dr Bhat’s Hospital in Ambattur for treatment for wearing bi-focal lenses due to poor vision in her right eye. The doctor, in this case, advised the patient to undergo an immediate cataract surgery, while guaranteeing to restore her vision. The patient underwent the surgery on August 31, 2004. After 10 days of the surgery, the bandage was removed, only for Kamatchi to realize that she could not see permanently from her right eye now. Only after reassurance by the doctor that her vision will be restored after few hours did she (Kamatchi) pin her hope back. However, there was no recovery even after few hours. So, she went back to the hospital on September 12, 2004, only to be admitted again to the hospital and later referred to Shankar Nethralaya after two days. However, there was no respite for her. Therefore concluding, that the “irrelevant surgery” had led to permanent loss in vision, she moved the district consumer disputes redressal forum, Tiruvallur seeking compensation for medical negligence. As reported by TOI, denying the arguments, the doctor said Kamatchi was advised of the procedure, risks and post-operative complications of the surgery.. The surgery and the post-operative period were without any complications. After being discharged, she was advised to regularly apply the prescribed eye drops and report for a follow up after three days. Kamatchi, however, reported for follow up, only with an inordinate delay of 16 hours with complaint of pain and loss of vision. She also admitted to not applying the eye drops regularly. After being admitted, she was provided the “best treatment” for showing signs of a post-operative complication. As her condition did not improve, Kamatchi was referred to Sankara Nethralaya. President of the forum, S Pandian said the hospital had admitted Kamatchi and referred her to Sankara Nethralaya after two days. This, created suspicion over the nature of treatment provided by the hospital. “It goes without saying that even an hour of delay endangers human life,” said the forum adding, despite Kamatchi losing her vision, she was referred to another hospital after an inordinate delay of two days.